The aim of the project is to generate random output for "Yes" or "No". When user press the button, it will turn on green LED (yes) or red LED (No). This simple project can be used for your first time in microcontroller project or you can used it to play mini game. It also can be used to replace "coin flipping" at the start of sport match. 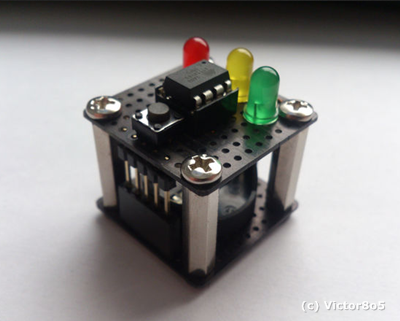 The arduino decision box is built using AVR Attiny85, CR2032 battery, resistor and LED. It's nice project for your spare time. Arduino decision box designed by Victor8o5.